4 More Desert Rose Plates! Four More Plates! Four More Plates! I hear the eBayers cry out for more plates. And while you are wondering why Mojo is hearing voices (if I were you I'd mutter quietly among yourselves and slowly back out of the room) I an sitting here wondering how on earth I am going to make plates interesting. It was a stretch with the first batch, but now....geez, what can you say about plates? They're round. They're about eight inches in diameter. In the first auction I called them "dinner plates" but since then I have done research (Oh, yeah, sure, maybe I should have done some research BEFORE I open my big yap, but that's water under the bridge now, ain't it?) and I have seen other people call these eight-inch plates "lunch" plates. Me, I've never heard of lunch plates. I've heard of bread plates and dinner plates and paper plates and the steel plates I have inside my head (oh, wait, those are imaginary) but I can't imagine why you would need to have separate plates for freakin' LUNCH. Unless you are a plate maker trying to sell more plates. And if that's the case, why don't they make weekday plates and weekend plates? Or plates for every day of the week, like they did briefly (HA!) in the Seventies for underwear. Imagine the social fox paw you can commit should you use your Thursday plates on a Monday! I don't think I want to be seen with you in public if you pull a stunt like that. 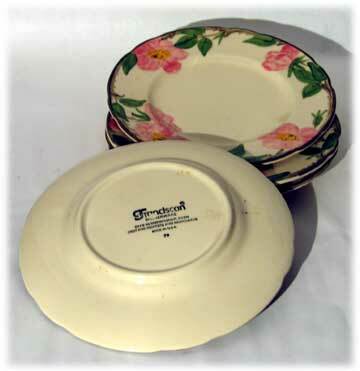 Anyway, these are Franciscan Desert Rose 8-inch plates. Use them for lunch or dinner, see if I care. Use them for breakfast and watch civilization collapse around you as you eat. I don't know what the Franciscans had to do with plates, anyway. Just before I acquired these I happened to watch the Zefferelli film Brother Sun, Sister Moon and they were mostly barefoot and muddy from building their little abbey. And then a friend let me borrow a Rossellini film called The Flowers of St. Francis and I thought Brother Genepro (I guess he's now Saint Juniper?) was cute as a button. But in neither film was there much mention of dinnerware, nor did the monks use nice place settings like these. So ya got me there. So much for word association. Next time I will try non sequiturs instead. Like this: horse radish. Alfalfa. Steel-belted radials. No, I don't think non sequiturs will help sell plates, either. Oh, well, it was worth a shot.